When it comes to highlighters, Anastasia Beverly Hills has it nailed. From their Illuminators and four-pan palettes which are forever sold out, it will come as no surprise that everyone went into a tizzy when the Ultimate Glow Kit was released. And with such admiration for the brand and my weakness for highlighters, I swallowed the price tag, took the plunge and purchased the limited edition palette. But before I ramble on, I must admit I have mixed feelings about this palette. In short; it's a sparkly one! Each ABH palette has previously catered to different tastes and skin tones and the Anastasia Beverly Hills Glow Kit in 'Ultimate Glow' £44.00 is no exception and features 6 limited edition gold-hued highlights, bar the shade 'Snow' a true pearly white. It's the first Glow Kit with a mirror and has the same sleek cardboard packaging and outer sleeve as the previous Glow Kits. 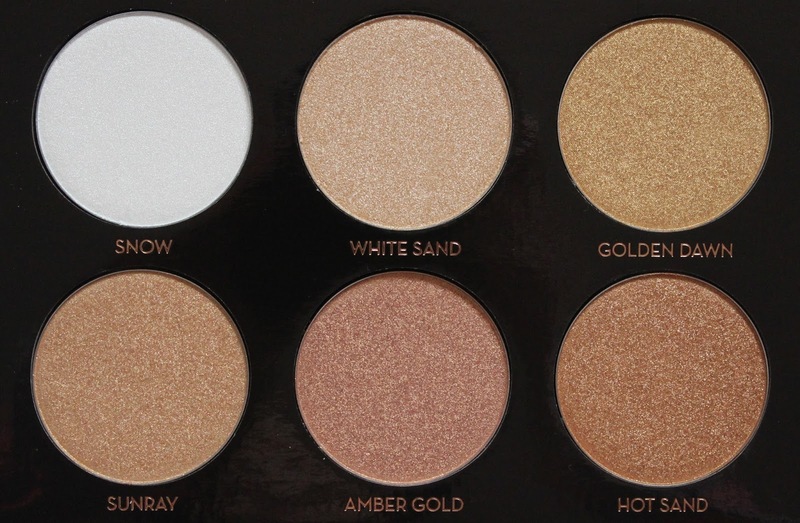 And like ABH's Glow Kit in 'Moonchild' the pans cannot be removed (which is a real bummer!). However, ABH doesn't skimp when it comes to their highlighters and each shade is 0.16 oz, meaning they'll easily work with your biggest powder brush and will last forever. The ABH Ultimate Glow Kit doesn't match the quality and pigmentation of other ABH Glow Kits. Sadly, the formulation of this Glow Kit is a tad too glittery to make my love list and is better suited for someone who likes to sparkle. If you like a natural, lit-from-within kinda highlight this palette isn't the one for you. 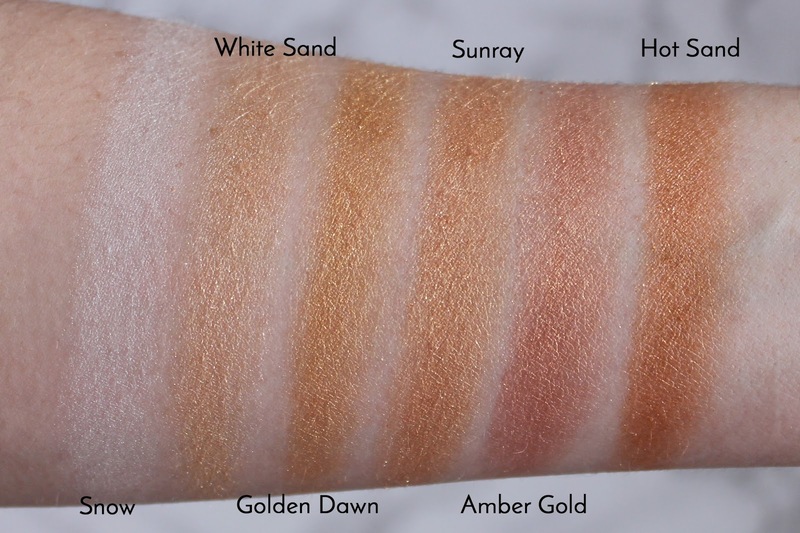 I also find a few of the shades are a little problematic, as they can accentuate my skin texture, especially the shades 'Golden Dawn' and 'Hot Sand' which has a copper sparkle. But the shade 'Snow' a beautiful pearly white, is the only shade in the palette that I find has a truly smooth creamy consistency that doesn't emphasise my pores or my skin's natural texture and looks flawless on the tops of my cheekbones. To be honest, it's unfortunate this shade isn't sold alone! Overall, I find the highlighters are a little dense and as a result I find the base colour doesn't translate onto my skin without a little extra work and the help of a flat synthetic brush. Personally I find these highlighters are easier to use on the eyes and work well mixed in with my blusher. But I'm not convinced it's worth purchasing the £44.00 kit alone for eyeshadow. If you have a medium to dark skin tone, I can imagine these highlights would look beautiful and are ideal for a night out. But it's not a palette I'd recommend for fair faces and I wouldn't class this product, as a definite makeup must have for all ABH obsessives. Snow: a truly pearly white with a metallic sheen. White Sand: champagne gold with warm undertones and metallic finish. Golden Dawn: warm gold with a sparkly metallic finish. Sunray: peachy-bronze with a copper sparkle. Amber Gold: rosy gold with a yellow and gold sparkle and shimmer. Hot Sand: medium-dark copper with orange undertones and copper sparkle. 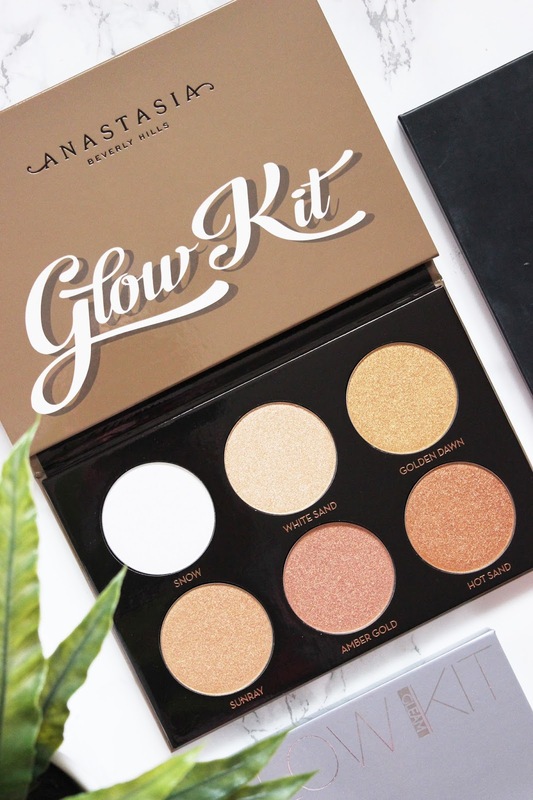 Have you tried the Anastasia Beverly Hills Ultimate Glow Kit?